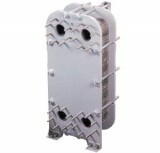 Plateflow heat exchangers provide more heat transfer in less space. No other technology is more compact, efficient or flexible. Plateflow offers “true” countercurrent flow maximizing the mean temperature difference between fluids.